Cullen says he’s a cool guy but that he could use some clothes anyway. Jumpsuit, monk’s cassock, sweats, PJ’s, jogging suit…whatever you call it, it’s cool! Cajun, our eleven year old greyhound gets cold at night when the heat’s turned off. When he’s cold, he digs or nests. Digging in blankets in a crate is one thing, but Cajun sleeps on the couch in the living room — the couch that now has holes in it. We tried putting his coat on him (which helped somewhat) and we also tried a sweatshirt knotted at the waist. He still wasn’t warm enough and the middle of the night would find us waking to the sound of greyhound nails tearing cloth, sending us screaming into the living room to stop the destruction. The solution turned up at a dog show when I found a booth with custom made jumpsuits for all breeds. These are polar fleece so they are lightweight, warm and water resistant. They are fully washable, machine dryable and very well made. The jumpsuits are open underneath from the middle of the chest back to the tail enabling male dogs to lift their legs without wetting the jumpsuit. This makes them ideal for outside in colder climates. The neck is long enough to cover Cajun’s ears if we wish. I chose a camel color that matches Cajun’s red fawn fairly well. My husband says Cajun looks embarrassed to wear it (read here: husband is embarrassed to walk dog while dog is wearing jumpsuit), but I think Cajun likes it. He jogs along proudly lifting his front legs in a high stepping trot. The jumpsuit comes in virtually any solid color and some wonderful plaids and patterns. The one problem I have found with the jumpsuit is that there is no opening in the neck to allow a leash to pass through and the neck is relatively tight. If your dog is wearing these as pajamas this isn’t a problem, but if you are walking outside, it means the collar has to go over the neck of the jumpsuit. I asked the woman who makes them if it would be possible to include a button hole for the leash, but she felt that the neck wouldn’t be as strong. I also have to be careful of Cajun jumping as he seems somewhat restricted while wearing the jumpsuit. He is able to jump onto the couch or the bed, but not as high as into the truck. So if he wears his jumpsuit outside, we lift him in and out of the truck and my husband claims this adds to Cajun’s embarrassment. I know of another greyhound who has one of these jumpsuits. He lives in the aptly named city of Cold Lake in northern Canada. Rush wears his jumpsuit to sleep in and to go out jogging with his owners. However, when his owner’s first got the jumpsuit, they realized that it was too large and needed adjustments so they made arrangements to ship it back. It was sitting in a box on the dining room table, and Rush pulled it off so he could cuddle with it. He loves to lie on the floor and bury his face in it and if he can, he takes it upstairs to sleep with it. His owners say he is very patient having it put on, considering it usually takes them a few tries to get his head through the neck hole. Ordering information follows. Kathy makes these jumpsuits in her spare time, so make sure you give her plenty of notice before you need one. 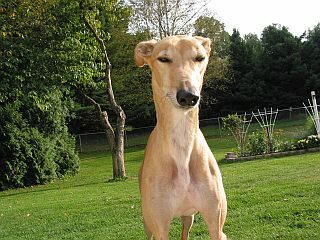 Be sure to specify whether your dog is a track or show greyhound as there are differences in the sizes each would wear. Dog Wear and Accessories, Kathy Beck, 8691 Rowan Road, Dewdney, B.C., Canada, VOM 1HO or phone 604-826-1101. Cost for a greyhound jumpsuit is $45 Canadian (approximately $35 American) plus shipping. Ed. note: We couldn’t find Dog Wear as of 2012 but many folks now make greyhound/dog pajamas.